In liturgies throughout the world, beeswax altar candles are burned to symbolize Christ as the Light of the World (the flame), His divinity (the wick, hidden by His humanity) and His humanity (the wax). As the candle burns and gets smaller, in a sense it sacrifices itself, just as Christ sacrificed Himself on the Cross for our salvation. Angel Direct offers a complete selection of Dadant Candle and Will & Baumer beeswax and stearine altar candles for all liturgies and budgets. Dadant Candle (est. 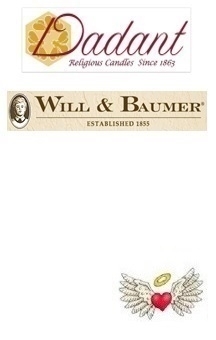 1863) and Will & Baumer (est. 1855) premium beeswax altar candles have been preferred by thousands of churches throughout the United States. 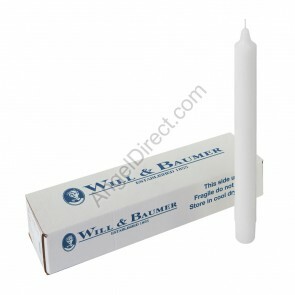 Use Angel Direct’s “Shop By” filters on left side to easily shop for altar candles by wax type, brand and price, and use Angel Direct’s SelectWizard on product page to easily find the correct altar candles for your church. AD Heavenly ValueTM – Before placing your order, use Angel Direct’s shipping estimator (add product to cart, then select “View All”) to see our unbeatable UPS Ground shipping rates on all altar candle products.